The Hydraulic stacker made by us has been designed to take into consideration the durability, mobility and rigidity factors that are of utmost importance for the job that the stacker has been put to. The chassis has been manufactured out of the best quality steel so as to give it strength to low weight ratio. The vertical guide mast is the most important part of the main chassis. 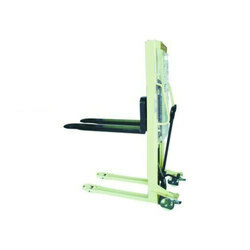 The vertical mast channels and the straddle leg are molded out of hot rolled steel so as to impart them great strength. The rollers that are fitted into the mast are molded out of alloys of steel and have ball bearings. 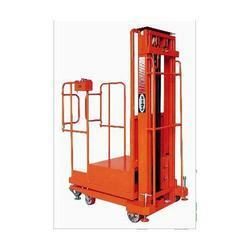 In order to serve varied demands of clients, we bring forth our quality range of Telescopic Platform Stacker. These stickers are well accepted among our clients for their sturdy design and excellent operational efficiency. We utilize modern manufacturing processes for fabricating these stackers in different specifications with maximum precision. Furthermore, with the help of skilled personnel, we supply these in defect-free packaging within the calculated time frame. Hollow Section Size 10" /12"
We are one of India's largest manufacturer's of steel pallets.We are known in the market as a reliable manufacturer, supplier, and trader of best quality Steel Plates. Owing to their fabrication by using finest quality material and technology, these products are highly durable and excellently finished. Our offered pallets are quality tested under strict norms for ensuring defect-free delivery of products. Moreover, varied stipulations of these products are available to us in different specifications at affordable rates. Lightweight & heavy duty application! 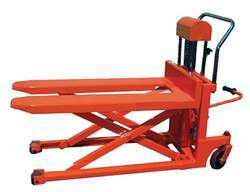 Hydraulic Stacker at a very reasonable price. Made with the best raw materials this product has been in very high demand with our clients. These have a very robust construction and are shock resistant. 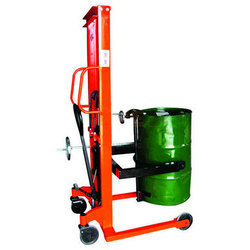 Gujarat Shree Modi Material Handling Co. is a reputed manufacturing company of stackers and our Hydraulic stacker is the best that is available in the market. The Platform or the Circuit Breaker Stacker is manually operated. 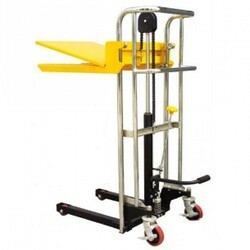 This equipment can carry very heavy loads for it has been made of excellent materials and has a very sturdy built. Owing to divergent demands of our customers, we are manufacturing and supplying high quality Drum Stacker. Our offered drum stacker has extensive uses in oil and manufacturing industries, due to their optimal load bearing capacity and high durability. Our skilled professionals design these machines in various stipulations by using fine grade raw material and cutting edge technology. Moreover, clients can avail these machines according to their need at affordable rates. 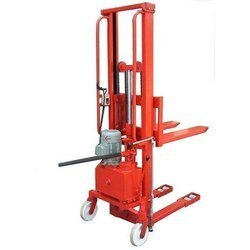 Looking for Hydraulic Pallet Stacker ?